Complete chaos. 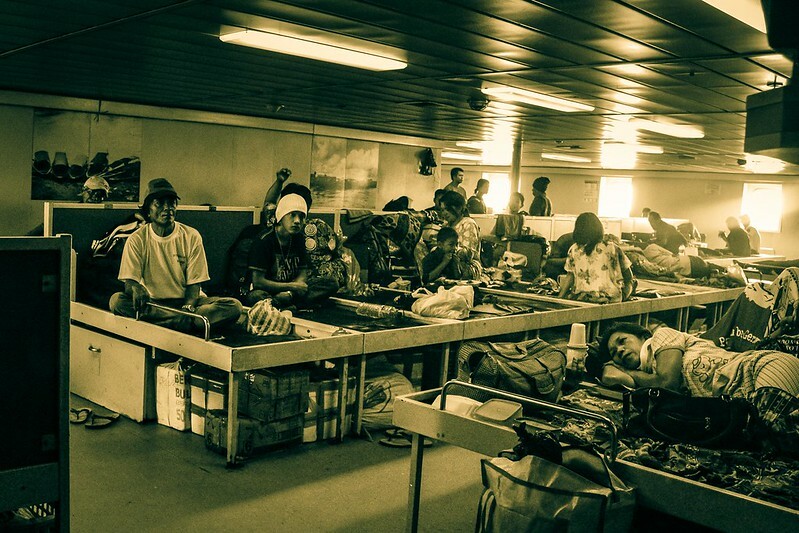 That’s the best way to describe boarding procedures on the slow boat to Sulawesi. 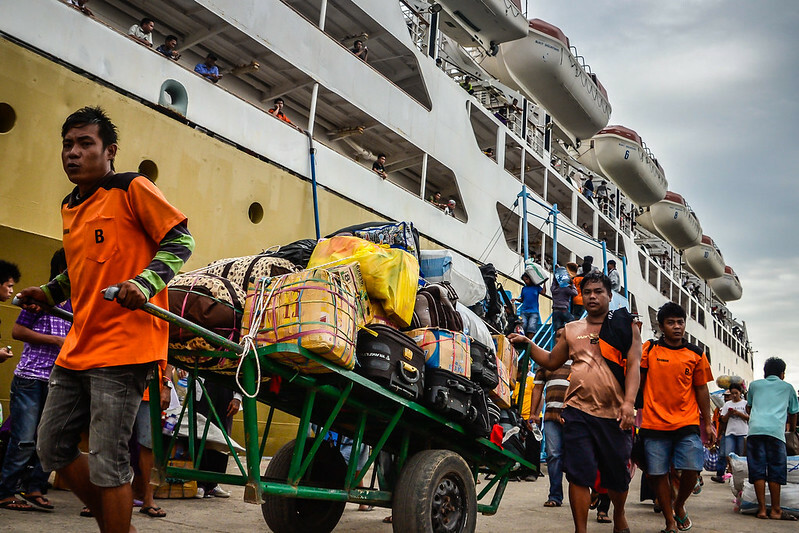 Passengers debarking in Nunukan stumbled down a steep, metal plank while porters loaded down with goods simultaneously attempted to squeeze and shove their way onto the ship. Unsurprising result: a big bottleneck and nobody moved. It was one of those shake-your-head-in-utter-dismay moments. Alright, I know it’s uncharitable to pass judgment (especially on the absurdly friendly Indonesians). But couldn’t they bring in the Swiss for a little logistical training? Even a simple step like allocating one door for entry and another for exit would work wonders. Moveable steps rather than a precarious contraption with ropes to pull yourself on board would be a major improvement. But no. Husbands swung pregnant wives on their backs and hauled them aboard. 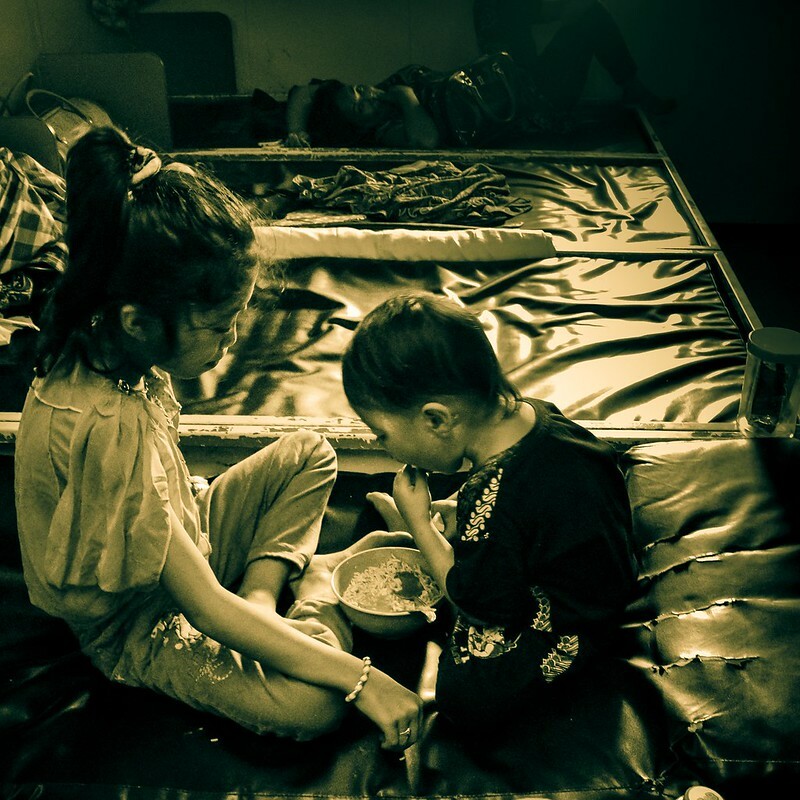 The old and disabled were carried like small, sleeping children and gently placed on deck. And the two foreign cyclists with over-loaded bikes were helped aboard by a small posse of do-gooders and a military man with a bull horn charged with keeping back the masses. 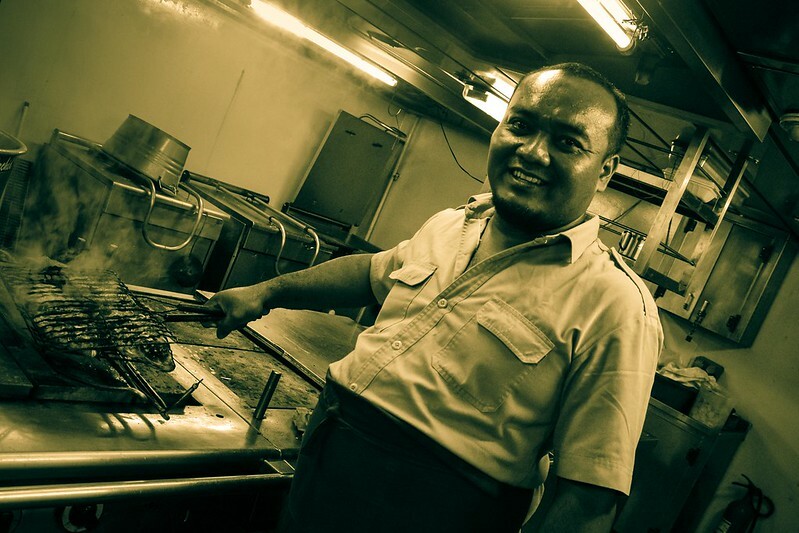 This being our tenth Indonesian ferry, we knew pretty much what to expect. 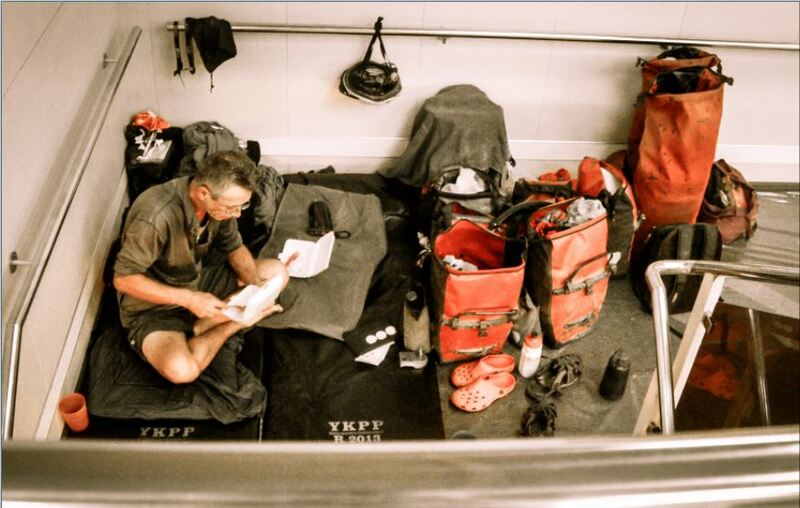 Smelly toilets, smokey, clove-scented cabins and sleeping bodies EVERYWHERE! Lucky for us, the indulgent first officer (we’ve yet to meet an unkind Indonesian) let us squat outside the officer’s cabins. A clean, pleasant smoke-free environment with high-powered air-con. Sure, you couldn’t switch off the lights in the corridor, but when compared to conditions outside in economy class, we were living the high life. Not exactly the Love Boat, but the 40 hours on board were more than bearable. 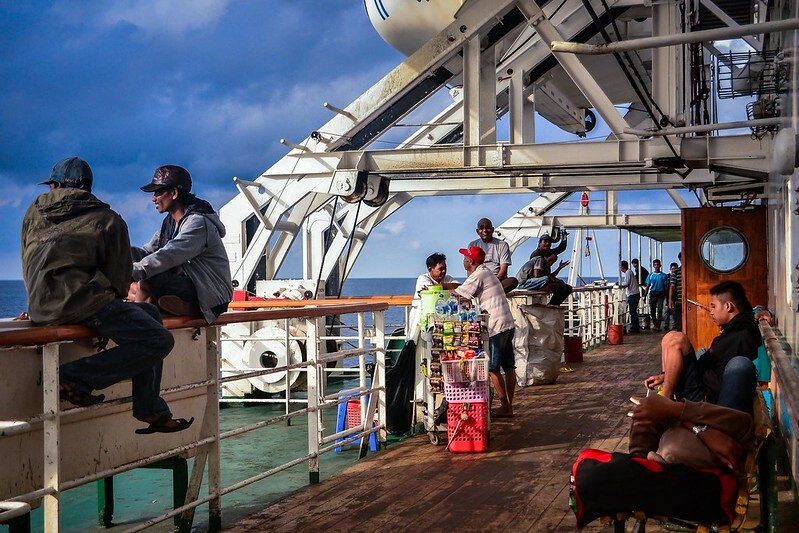 These photos will give you a better idea of reality on the slow boat to Sulawesi. Our cozy spot in the stairwell leading to the captain’s quarters. Luxury compared to what most passengers endured. Families deep in slumber as dawn breaks. It amazes me how deeply people sleep in spite of bright lights and the noise of fellow passengers snoring and others tripping over them on their way to the toilets. Drowsy passengers in the economy class cabins. 90% of male passengers puff away on clove cigarettes, toddlers squeal, mother’s nurse shrieking infants and students get out the guitar for a round of classic American rock and roll tunes. Pretty full on, but fun. For awhile. Those caught thieving on Pelni ships are given a good roughing up. Fresh air on a stroll around the upper deck. 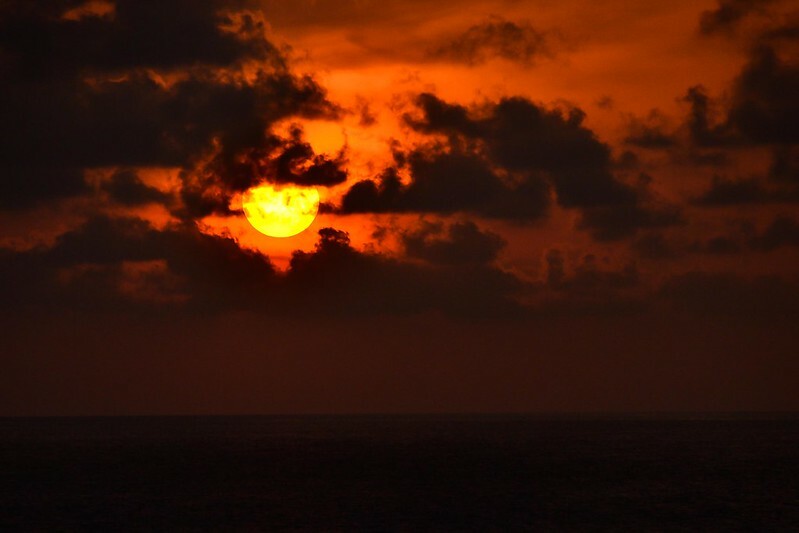 Everybody gathers round at sunset to enjoy the cool breeze and calm atmosphere of the sea. 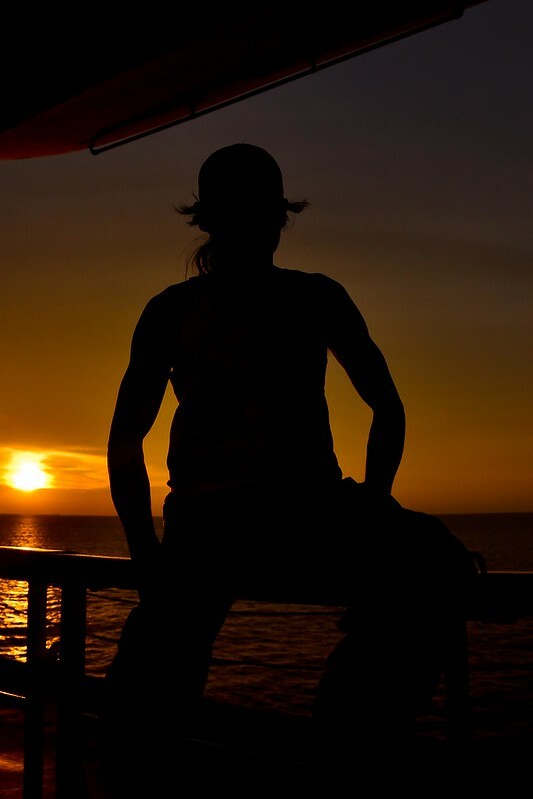 Sunset on the slow boat to Sulawesi. 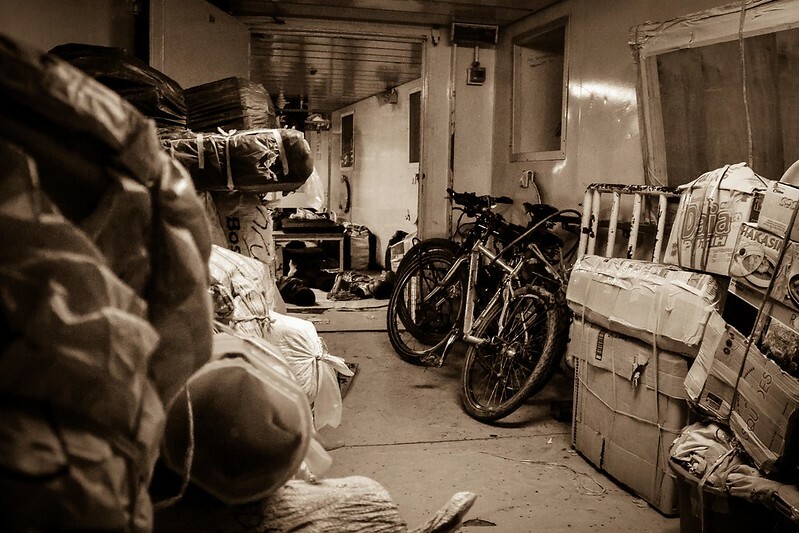 The Koga’s are safely stowed away on the lower deck. Slow life on the slow boat. The friendly cook who always slipped us extra rations of rice and fish. One of the many friendly passengers aboard. 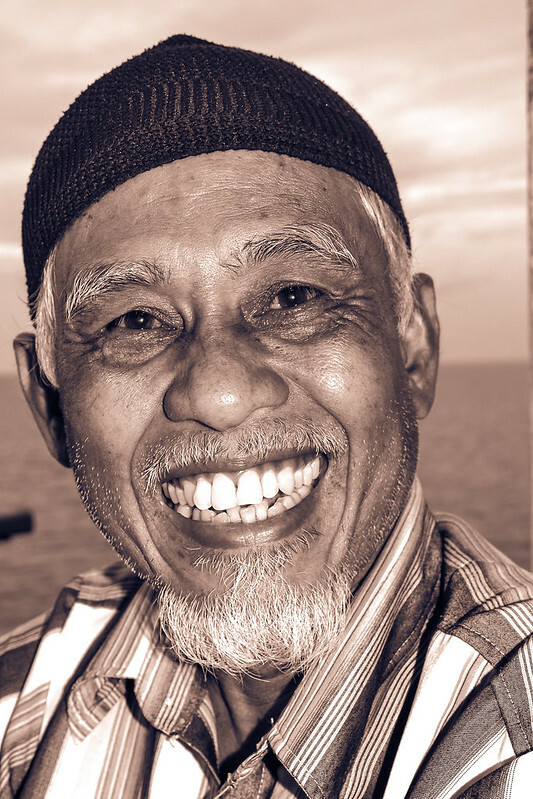 Indonesians love having their photo taken and they love taking photos of foreigners. Any walk around the deck always meant posing for at least a dozen snaps. Disembarking in Pare Pare where the port is actually organized (at least compared with Nunukan)! It probably helped that we got off the boat during daylight instead of the middle of the night when we boarded. 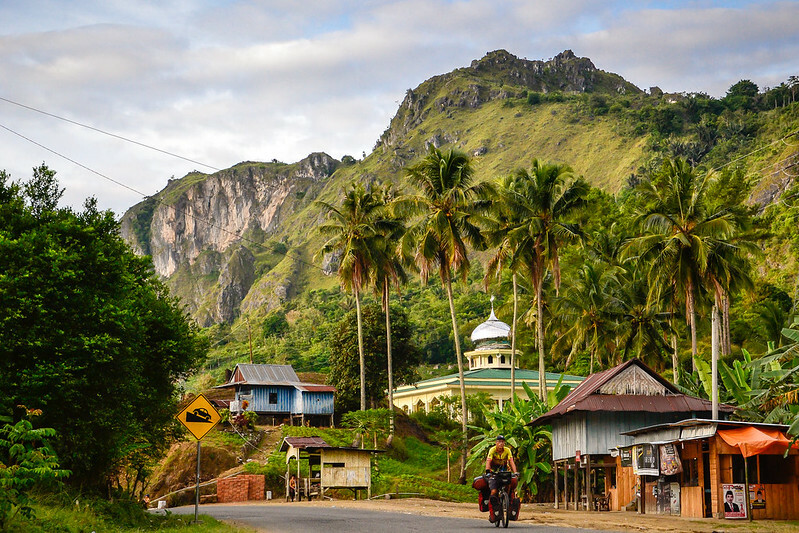 Our first day cycling out of Pare Pare–all mountains and mosques…Sulawesi’s shaping up to be a fine cycling destination. Download our NEW East Asia e-book. It’s FREE! Bless ahead of you !!! Thanks Garfunkel! Hope 2014 is off to a great start for you and your family–hope the girls are doing a lot of biking! 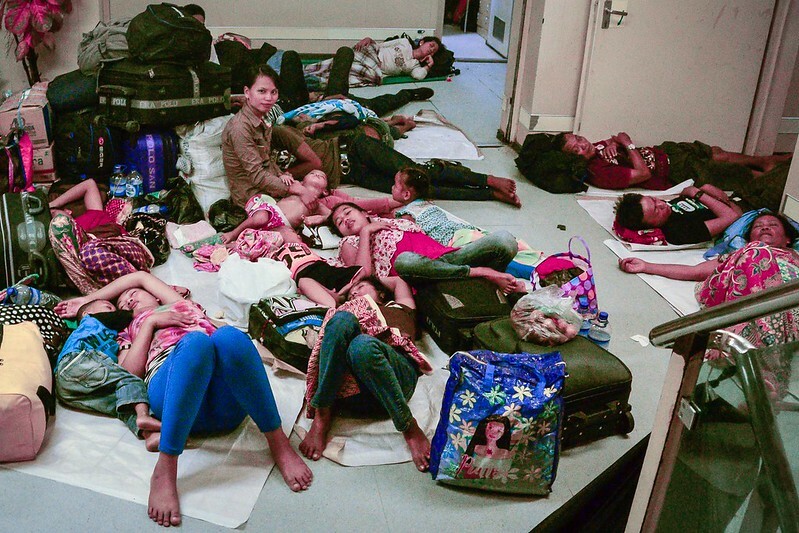 Now that we’ve almost survived our Sulawesi tour (perhaps the most trying two months in all our time touring) the next 2 years can only get easier. Hope you’ll still be in the UK in the summer of 2016 so we can meet up! thanks for the many pictures and your update. It helps me to relive your adventure. Great to hear from you, Craig! Maybe you’ll tag on an Indonesia tour to your next Australia ride. Beautiful here, but the absolute opposite to your climate–here it’s rain, rain and MORE rain! Really interesting read about Sulawesi. I’ve cycled the Makassar-Manado route a few times now. 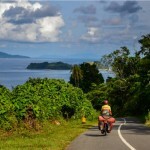 I’ve lived in and cycled throughout Indonesia for the better part of the last ten years, and for me Sulawesi offers some of the best cycling in the islands. You’re right though: some tremendously steep roads. I had an experience about 150km’s west of Gorontalo on the trans-Sulawesi where I didn’t want to give up on the ascent. I should have. My chain literally exploded as I pumped my way up. Still unsure how some of these trucks do it. I actually cycled the Toli-Toli route a couple years ago. The photos you have really surprised me. I thought they’d never finish the project to seal the road. Looks really nice now. I had to trudge up most of the hills as my tires had no traction on the dirt (dry season was the only way I could do it – like pedaling through sand at points). You mentioned cycling over 3,000km on the island. I’d love to see the route you followed to get this much out of it. If you feel uncomfortable posting it online, but comfortable enough to post to a fellow cyclist, you can use my email I provided. I assume you went from Pagaimana down to Poso? 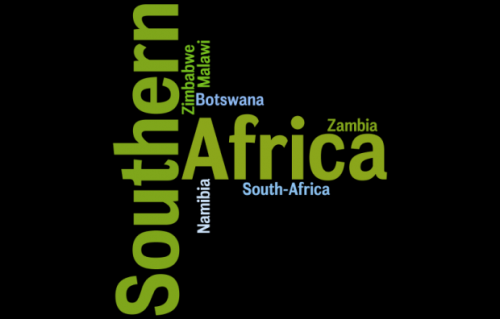 Or did you round the eastern Peninsula through Luwuk and towards Kolonedale? I guess if you threw the eastern arm in, 3000+ is a possibility. In any event, it looked like a pretty extensive tour! Also did you guys head into Sulawesi Tenggara from Sulawesi Selatan or Sulaawesi Tengah? Last time I was actively cycling that part of the island, any news of making the provincial crossover was sketchy at best. Nothing worse than pedaling 80km down a Sulawesi road to find it leads nowhere. But I’d love to get down there if it’s possible now. Really great photos and happy to see that Toli-Toli road is now in better shape. For how long, who knows…. Guess I ought to hit it again while it’s in good form. Thanks for the updates from the road! Yes, it is amazing how some vehicles manage to grind their way up such steep descents. No’s the time for the Toli Toli roads because it’ll surely deteriorate quickly without proper maintenance (which is unlikely to happen). No problem posting the route–actually started to make a map but then it somehow got messed up and I gave up in a fit of frustration. Will post the log online. Anyway, great to hear from a fellow Sulawesi cyclist–this place really deserves more tourism than it gets. Here’s our log for the Sulawesi tour. Not so easy to follow, but that’s the stats we’ve kept. Hi… Let me introduce myself to Amaya. I met Eric and had dinner at Plasa Senayan two days ago, the nearest at that time for Eric to try Gado2 (salad with peanut sauce)… really amazed with what you two have been doing for the last 8 years, which for most Indonesians (probably Asians) are insane (in positive tone)… just unbelievable. Definitely felt honored, that I can had a chat with Eric. Hope your mom gets well soon. if possible, we try to get small group of cyclist to go on a short trip with Eric, while lonely here on one of the weekends. 15th May is public holiday. Hopefully we can plan something.